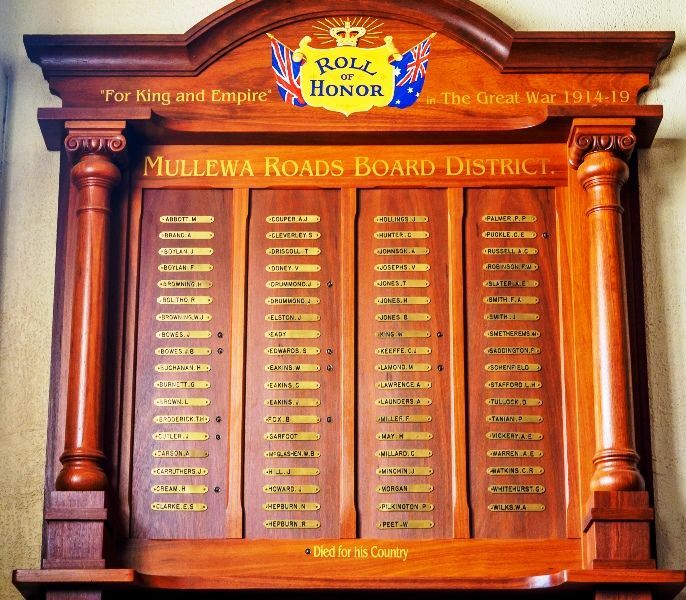 The Mullewa District Honour Board was unveiled on Friday afternoon, November 21. His Grace Archbishop Riley, was present at the unveiling and gave a very interesting and descriptive account of his experiences abroad as Chaplin (sic) General to the Australian Imperial Forces. He spoke in glowing and appreciative terms of the Australian soldiers, and expressed his pleasure at being able to be present that day. The board was unveiled by Mrs Eakin, whose three sons' names appear on the board (a star, representing the supreme sacrifice appearing beside one of the names). Mrs Eakin was presented with a beautiful bouquet of honeysuckle and roses by Miss Mollie Sandstrom. The board, which was made by Miliars Ltd is a beautiful piece of work, being massive, and of polished jarrah. 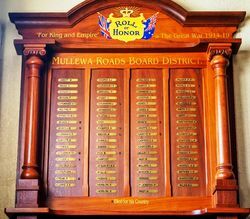 The Imperial Crown, supported on either side by the Union Jack and Australian flag is painted in colours at the top, while underneath are the names of over 70 soldiers, who enlisted from the district, each name being engraved on a brass plate and securely fastened to the board at equal distances. It is erected in the Town Hall, which building was lined for the occasion by means of a "busy bee" under the direction of Mr C Edwards. The secretary (Mr Hillbrick) takes this opportunity of thanking Mr Edwards and Mr Sandstrom also the other gentlemen who so kindly came to his assistance. He particularly wishes to thank Mrs Langford, of Mullewa and Mrs. N. Fry. late of Tenindewa, for the valuable assistance they rendered him in collecting both money and names, as he could find absolutely no record kept anywhere of the men who had enlisted from here. 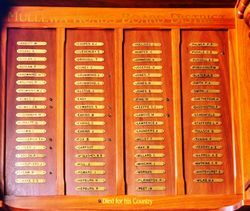 If there are any names which unfortunately have not been secured, the committee will be only too pleased to have same placed on the board, as there is still a little remaining room. Geraldton Guardian (WA), 4 December 1919.